Robinsons, one of Wigan's oldest companies, and the largest equestrian mail order company in the country, have agreed title sponsorship of a new national one-day event at Standish, taking place on Sunday 7th September. 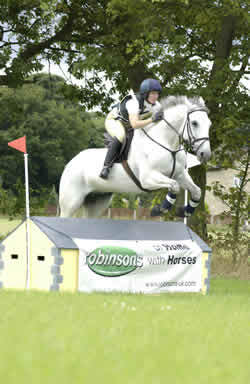 The Robinsons' Standish One-Day Event is affiliated to British Eventing and will be held at Thompson House Farm, which is sited off Pepper Lane, Standish, Nr.Wigan. The cross-country course has been built from scratch on the Thompson House Farm site and the event is expected to attract more than 210 entries from across the UK. The competition will be run in six sections and will feature Intro and Pre-Novice classes, which cater for horses and riders starting off in the sport. Robinsons' Managing Director Jim Bentham commented: 'As the opening date of our Superstore at Haydock draws ever nearer, we are delighted to support Standish for the inaugural running of their affiliated one-day event and we feel sure that all competitors will have an enjoyable day." Entries Secretary for the event is Mrs L Payne, 3 Greenlands Avenue, Standish, Nr. Wigan. Editor note: Robinsons largest equestrian store in the UK was totally destroyed by fire last September. A new Superstore is being re-built on the same site, located half a furlong from Haydock Park. The opening date for the Superstore will be announced shortly.